A tough cop, a clever bank robber and a power broker fuel a dangerous game of cat and mouse full of hidden agendas and explosive surprises. You are nuts if you think a Spike Lee helmed cop-robber thriller would be a high-octane action pyrotechnics fest. 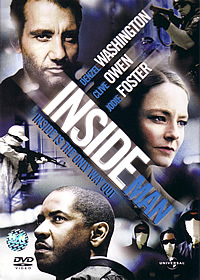 Throw in Academy Award winners Denzel Washington and Jodie Foster in addition the charismatic Clive Owen plus veterans such as Willem Dafoe, Christopher Plummer and you get a smart fast-paced thriller “Inside Man”. The story simply grabs you from the start. Owen is the leader of four bank robbers who robbed the Manhattan Trust bank and held the staff and customers as hostages. Washington is the negotiator assigned to the case. At this point, the plotline seems normal enough, “man rob bank-cop comes in- robber retaliates”. The banter between Owen and Washington is as addictive as a good cup of kopi as both men tries to outwit the other. Watch out for a short scene as Owen’s character throws the cops a riddle, a trick question that sends them into a frenzy. But the story doesn’t ends there, Arthur Case (Plummer) the Chairman of the Manhattan Trust it seems has a dark secret hiding in the bank vault and Owen’s character is perhaps targeting it. As if in an attempt to spice up the scenery by the scriptwriter, Case went on to engage White (Foster) a sharp witty power broker to break the deal with Owen. Now I do not wish to dwell further into the plot but seeing Washington, Owen and the almost reclusive Foster interacting on screen is a gem to behold. Lee’s attempt in this genre is a triumph and the theme song "Chaiyya Chaiyya" (an Indian song) used at the start of the movie will spin in your head days later. Theatrical Trailers - Surprisingly, the trailer for "Inside Man" is not included instead you have the trailers for "Jarhead" and "King Kong" dvd and the upcoming "United 93". A poor serving of extras for a good old crime thriller like "Inside Man". Wouldn't it be fun to listen to the actors' commentary or Spike Lee's views on it? Presented in Dolby Digital 5.1. , dialogues which are heavy here are of the utmost clarity. You wouldn't miss Owen's muffled voice behind his mask. The vulgarities which are muted in the theatre version are left intact here thus earning the rating of NC-16. You can try counting the number of times the F-word is used here if you have time to kill. Visually, the transfer is rich and sharp. Even in dark shades, the colours are not compromised. Overall, the audio and transfer is excellent here.